my most disgusting post yet . 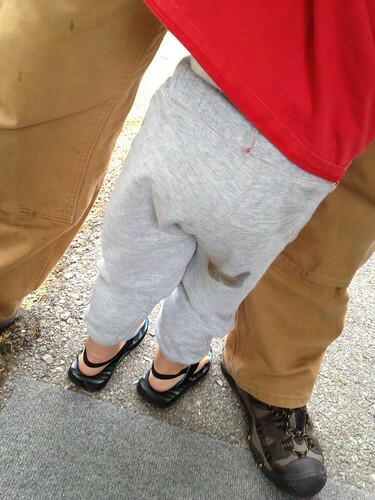 . .
Several months ago Quinten burned his bare bottom after backing up into our wood stove. I’d share a photo but I’ll spare you the ebejebies (how do you spell that word?) and spare myself the weirdos that would undoubtedly find this post. The sad situation came about out of an attempt to get cozy after a shower (it obviously backfired miserably). 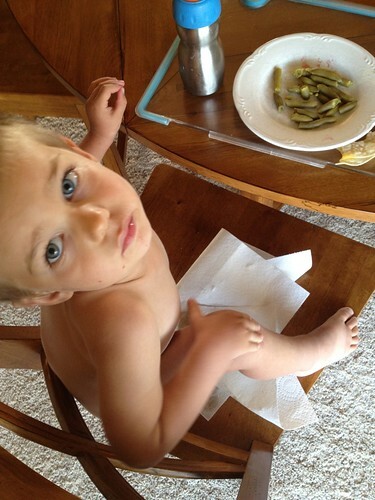 We decided to use our lemons to make lemonade by jumpstarting our potty training efforts in honor of our burned bare bottom boy who was now frolicking through the house. I even had reinforcements as my mother-in-law arrived just days after the “event” which doubled my ability to provide the necessary focus that potty training requires. All systems were “go” and with the help of my chocolate chip jar, Quiten was up for the challenge. We moved from diapers to cloth training pants and saw slow but consistant progress as the days passed. We cheered loudly, proudly wore potty watches and ate many chocolate chips. . .
Somewhere along the way however we started to backslide. 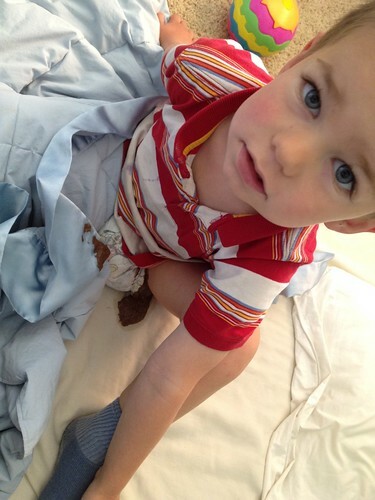 My focus wavered, accidents increased, the diapers reappeared and I knew the battle had not yet been won. 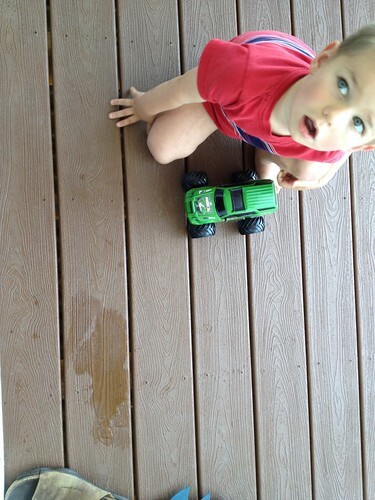 I have learned that there are many milestones that mark a child’s life. Several never find their way into the baby books. It is a shame as I believe they are the ones that would be the most fun to read about. 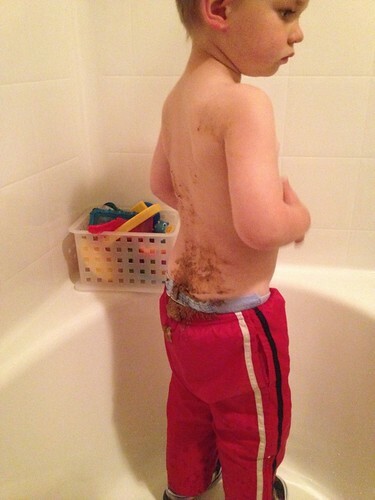 In my attempt to ensure good future reading material I begun documenting our recent potty mishaps. I’ll warn you, what you are about to see is not for the faint at heart, this is real life people. Real. Life. Those paper towels are not sitting there “just in case”, case closed. Well good morning there sunshine! What a lovely surprise you have there in your pants! I don’t have go guess who stinks here. 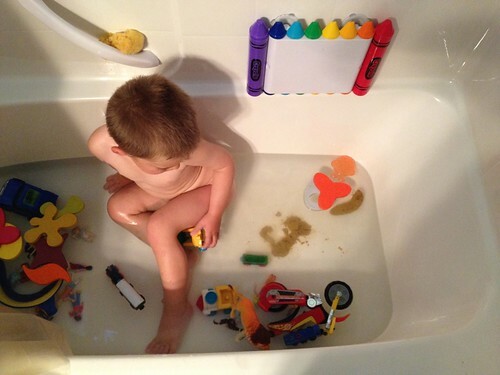 I won’t go into too much detail here except to say this was not our tub, but a friends. 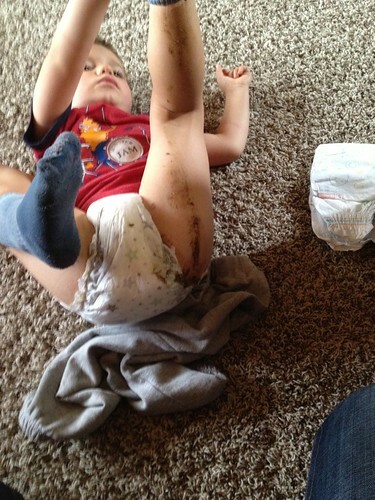 The poop was not just on Quinten, but also their carpet. And I was not the only one cleaning up (my husband is in the next room operating said friend’s shampooer). The upside to this lovely slideshow presentation is that Quiten has just lately begun voluntarily alerting us when he needs to go poop and going successfully on the potty, there is hope my friends, hope! So here is the part that you remind me that I am not alone, please share your potty stories! The post my most disgusting post yet . . . appeared first on Mom4Life Blog.